Port Lincoln may be famous around Australia for its seafood but, for most of its history, it was more notable as a port for barley and wheat grown on the farms of the Eyre Peninsula. The terminal at one end of the foreshore still ships millions of tonnes of grain each year and the adjacent silos dominate the harbour town’s skyline. It made a nearby industrial lot the perfect site for the Port Lincoln Bakery and for 60 years that’s where the town’s bread was baked until the business closed at the height of the millennium drought. 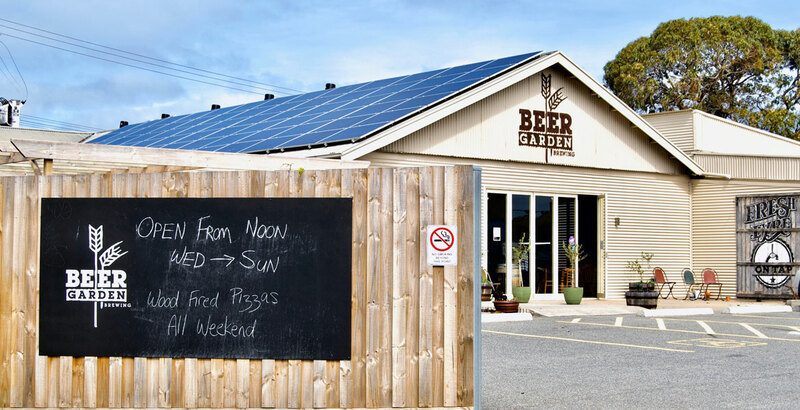 For a decade, the building lay empty until Mark and Janie Butterworth resurrected the site and now the large shed is once again receiving regular deliveries of local grain as the home of Beer Garden Brewing. It’s fair to say the pair have chemistry – Mark is a chemical engineer by trade and Janie is a biochemist – and they worked in the mines at Roxby Downs for 14 years until a downturn in the mining industry prompted them to look for a seachange, with Port Lincoln seeming like the perfect place to raise their three sons. Janie and Mark Butterworth with brewer Dan Treagus (right) at Beer Garden Brewing in Port Lincoln. Starting from scratch, they transformed the site, sourced materials and packaging, created a marketing plan and set up a kitchen. The locals were immediately on board, but the next step was convincing tourists to come and visit their brewery, which is a not inconsiderable 650km by road from Adelaide. When the brewery launched in late 2016 there were just two beers, the Eyre Peninsula Ale (an Australian pale ale) and Cage Diver IPA. The first batches were brewed at Regency TAFE, where Mark and Janie completed a brewing course and Janie still pops in occasionally as a guest brewer “for a bit of a laugh” and to help others as they start their journeys in brewing. Those original brews are still among the most popular but the range has since grown to fill all ten taps at the onsite bar. Every one of them uses some locally grown raw grain, including wheat from the Butterworth’s farm near Cowell after which the Section 49 hefeweizen is named. Unfortunately, due to drought their property didn’t produce a crop this year so they’ll have to source some grain from elsewhere next harvest, but there are plenty of other farmers lining up to participate. 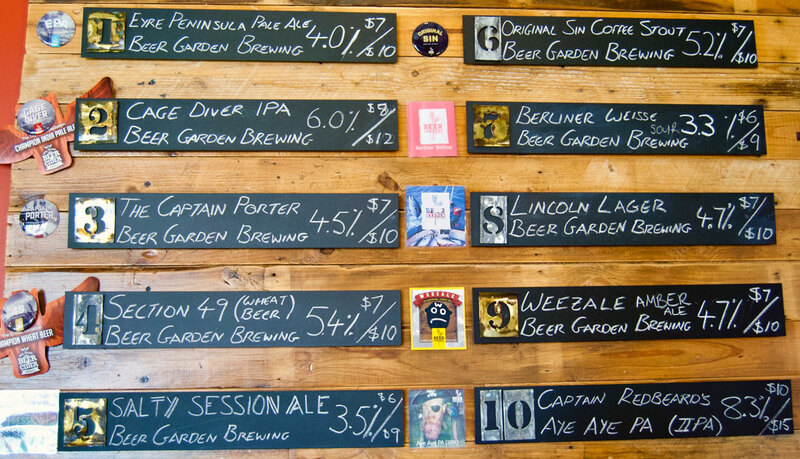 The tap lineup when The Crafty Pint called in to Beer Garden Brewing. Beer Garden beers take shape on the ten hectolitre fire brewing system they bought from Prancing Pony “with some fairly major modifications that give us greater control,” says Janie. With an open flame rather than steam jackets to control temperature, it’s a hands-on process and on Tuesdays and Wednesdays it’s usually possible to see Dan in action. The best place to watch is from the bar, where he also serves beers on the weekend. Both bar and brewery are housed in a large industrial shed held up by Oregon pine roof trusses, which means there’s plenty of space for the equipment, dining tables and a cosy seating area around a fireplace. And, after all that, there’s still leftover space, so Mark and Janie invited their friends from Eyre Roasted Coffee to join them. Being committed to using ingredients close at hand, it wasn’t too long before they collaborated on Original Sin, a rich, creamy coffee stout that utilises barley from the appropriately named Darke Peak. 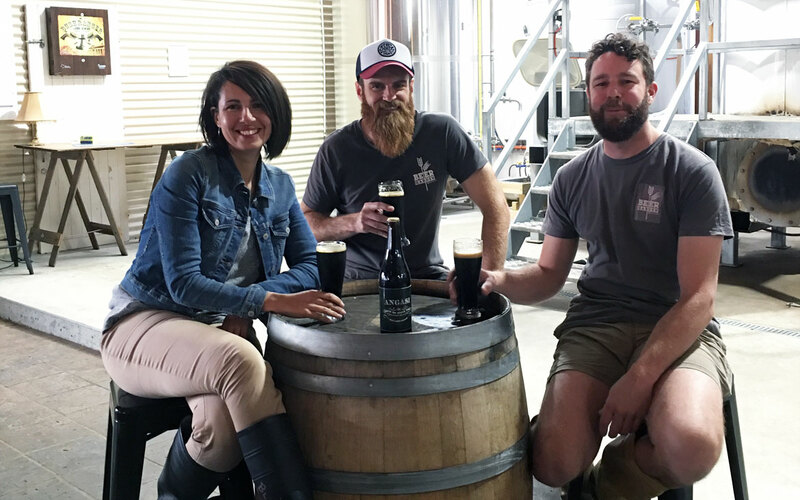 And if you'd like to see how that famous seafood works with the local grain, you can always try the Angasi oyster stout they created for GABS, which was brewed with 60 dozen Coffin Bay oysters. The Butterworths will be back at GABS in 2019, but that's still the only time their beers are available outside SA. “We are fairly well stocked throughout the Eyre Peninsula and the take up is always growing,” Janie says. About the author: Alexis Buxton-Collins is an Adelaide-based travel journalist who enjoys nothing more than ending a day of discovery with a cold beer in hand.